Team dynamics are an important predictor of organizational health. In most organizations, nothing gets done without people working together to achieve shared goals. But far too often the very practice of teamwork can be painful. Why? Because teams give way to infighting, gossiping, and politics. High-functioning teams break this mold by dedicating time and effort to embracing a healthier set of behaviors. Teams that work well together also perform better. Integris team takes a multi-pronged approach to improving the effectiveness of teams through sustained development efforts. In 2002, Patrick Lencioni wrote a leadership fable called The Five Dysfunctions of a Team. Today, with over 2.5 million copies sold, the ideas from this book have had a profound impact on how we view – and improve – teamwork. 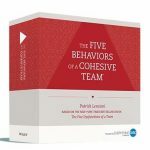 In 2014, a new era in team development began, when the concepts from The Five Dysfunctions of a Team were used to create a new framework for driving stronger teamwork across entire organizations: The Five Behaviors of a Cohesive Team™. Now, for the first time, a complete toolkit exists for teams, leaders, and HR and OD professionals who want to get the greatest results possible from their teams. When teams have a shared language around teamwork and when they dedicate time to understanding and cultivating these behaviors, amazing things happen. Do you want to help your teams – all of your teams, at every level – perform to their full potential? Act now to build a common language around the behaviors that create a truly cohesive team. Teams that engage in conflict around ideas are able to gain commitment to decisions, even when some members of the team initially disagree. That is because they ensure that all opinions and ideas are put on the table and considered, giving confidence that no stone has been left unturned. 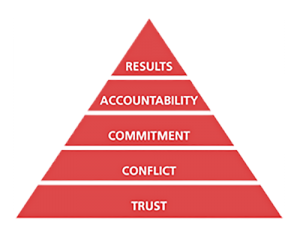 Teams that gain commitment to decisions and standards of performance do not hesitate to hold one another accountable for adhering to those decisions and standards. What’s more, they don’t rely on the team leader as the primary source of accountability; they go directly to their peers. Team members who trust one another, engage in conflict around ideas, gain commitment to decisions, and hold one another accountable are more likely to set aside their individual needs and agendas and focus on achieving collective results. They do not give in to the temptation to place their departments, career aspirations, or status ahead of the collective results that define team success. What Is A High-Functioning Team, And Do You Have One? In most organizations, nothing gets done without people working together to achieve shared goals. But far too often the very practice of teamwork can be painful. Why? Because teams give way to infighting, gossiping, and politics. It's about building better team behaviors.Team behaviors are an important predictor of organizational health. Great team behaviors squeeze out unhealthy organization behaviors such as gossip, politics, and infighting. The result? Work gets done with fewer unnecessary interpersonal interruptions. In time, not only do the processes work better; the people in the processes feel better. Team dynamics are an important predictor of organizational health and culture. Download The Blueprint for Team Cohesion to learn how your teams can get to the next-level. Teams that work well together perform better. Download The Blueprint for Team Cohesion to learn how your teams can get to the next-level. …a large reason why [The Five Behaviors™] was successful was because people felt heard. I got emails from people saying ‘no one has ever invested in me in this way. It’s FANTASTIC!